Beech Lodge in Garway, Hereford sleeps 5 people. 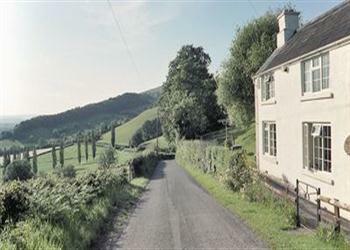 If you like glorious sunsets and beautiful sweeping rural views, abundant wildlife and walks from the doorstep, consider this completely secluded 19th-century lodge overlooking the Monnow Valley, set on a quiet lane in sheep country. Refurbished to a high standard, it nestles on a hillside in 300 acres of farmland, with its own terraced, south-facing garden. The Black Mountains are not only visible but are also accessible for walking or pony-trekking. Monmouth 7 miles. Abergavenny, Ross-on-Wye and Hereford, all within 12 miles. Ideally positioned for the Welsh borders. Fishing locally. Sitting-room with wood-burning stove. Dining-room. Fitted kitchen. Bathroom/W.C. with over-bath shower and heated towel rail. Separate W.C. First floor: Double bedroom. Twin-bedded room. Single bedroom. For a better idea of where Beech Lodge is, you can see Beech Lodge on the map below. Beech Lodge is in Herefordshire; should you be on the lookout for a special offer, you can find all the special offers in Herefordshire. It's always worth checking to see what is on offer at the moment. Do you want to holiday near Beech Lodge (QRU), you can see other cottages within 25 miles of Beech Lodge; have a look to find your perfect holiday location.